Japanese gamers will be playing Metal Gear Solid: Peace Walker earlier than other parts of the world, but not by too much. It was recently revealed that Metal Gear Solid: Peace Walker would be released in Japan in March, and Funk was right, I couldn't wait to see if the U.S. release date would also be announced soon. Thankfully, it was. Metal Gear Solid: Peace Walker for the PSP will be released in the U.S. on May 25, 2010, and in the U.K. on May 28. It's being billed as a direct sequel to Metal Gear Solid 3: Snake Eater for the PS2, but takes place four years after previous PSP installment Metal Gear Solid: Portable Ops, which took place six years after MGS 3. Players will once again take on the role of the Snake-ster: Naked Snake/Big Boss iteration. If it meets expectations, Peace Walker could end up being one of the top games in the series. First of all, the TGS 2009 trailer makes it look absolutely epic. The game is fully penned by Hideo Kojima again — in contrast to Portable Ops which was not — who says: "Metal Gear Solid: Peace Walker will answer many of the series' unanswered questions and showcase a different, more collaborative side to tactical espionage." I thought most of my questions were answered by MGS 4, but this is Metal Gear, so maybe I have unanswered questions that I don't even know about. 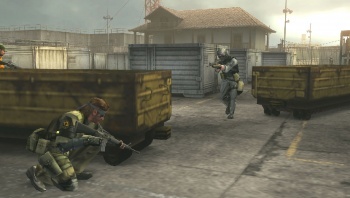 When Kojima says the game will showcase a more "collaborative side to tactical espionage," he's likely talking about Peace Walker's multiplayer CO-OPS mode, where players will undertake missions while acting as decoys for each other, administering medical help, sharing ammo, or sneaking around while covering each other's blind spots. But perhaps the biggest expectation Peace Walker will have to live up to are in its bosses, arguably the most memorable experiences in the Metal Gear series, which Konami says are the "most incredible end-of-level adversaries the series has ever produced." That's serious talk right there, so we'll have to see about that.